In One Day, Solve Your Financial Challenges For Life. 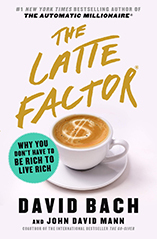 Author of nine New York Times best sellers, including #1 New York Times best sellers Start Late, Finish Rich and The Automatic Millionaire, David Bach will teach you why it’s never too late to live and finish rich. He will also share the secrets to becoming an “Automatic Millionaire” and how ordinary people with average incomes can achieve extraordinary wealth. You’ll learn the basics of financial responsibility, and quick, specific actionable steps to help you increase your savings, improve your investment returns, and crush your debt. David will show you why you’re already richer than you think. Whether you are in debt, living paycheck to paycheck or simply feeling behind schedule on your savings and retirement dreams, David Bach has helped millions take charge of their financial life and he can help you, too. The proof is in the numbers. With over seven million books in circulation around the world, over a million students, and over a hundred appearances on NBC’s Today Show, David’s teachings work. This one-day program takes a true deep-dive, change-your-life, comprehensive approach to fix, crush, and handle your financial life and financial worries once and for all. It’s never too late to live your dreams. WARNING: This is NOT a get-rich-quick program but rather a timeless, simple approach to money that anyone can act on in minutes. If you are looking for an “earn more money program, make money online, get rich in days not decades,” this course is not for you. If you want to learn in a fast, fun, and non-judgmental environment, how to build financial security for life, then this is for you. David tells it like it is, and he empowers you to take action now.